The rain pours down outside. To find something positive, I can conclude that there is no wind and the sea is smooth as glass. The pale shade of green in trees and bushes tells about a spring that ought to be here soon. April has been so chilly. Despite all the warm sweaters, I have been freezing constantly. The remedy has been full bodied wines with power. A few single malts have also passed by to bring some heat. It seems much too early for the reviews of this year’s rosé wines. However, the calendar says it is time and consequently we have been able to read many in recent weeks. It gives hope. The sun and the warm days have to lurk somewhere around the corner. Rosé has become so trendy. There has been a lot of “pink talk” the last few years. Of course it has influenced the consumers who are buying, drinking and chatting about them, usually in spring and summer time. It is nice that a previously undervalued type of wine has come into vogue outside of France. I have always liked a good rosé. Fortunately, the wave of rosés has brought with it a greater selection of quality. I favour the elegant ones with body, character and good length. Fruitiness, freshness and multifaceted appearance in nose and palate are also included on the wish list. Often I find the ones I prefer to be made of the grapes from southern France. Tavel in southern Rhône is the classical origin. An AOC where rosé is the only permitted type of wine. Tavel gives us wines that respond well to the requirements. Structure and body are there, freshness and fruitiness as well. 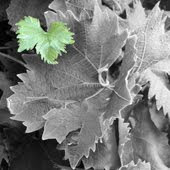 The grapes are Grenache and Cinsault, together with, among others, Syrah and Mourvèdre. A new favorite of mine is found in Costière de Nîmes, located only a short distance south of Tavel. This region received its AOC-status in 1986 and got its current name in 1989. 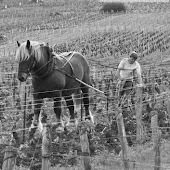 As recent as 2004 the AOC changed main region, as it was moved from the Languedoc to Rhône at the request of the growers. 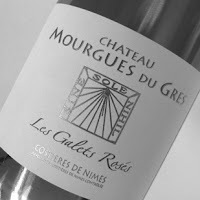 In Costière de Nîmes we find the small family-owned estate Château Mourgues du Grès. Franҫois and Anne Collard make whites, reds and also some beautiful rosés. Two of them are found on top of my list thanks to their freshness, concentration and body. “Le Galets Rosés” has exactly the right appeal to my palate. Made mainly of Syrah, with a little Grenache to season the blend. While this wine only has seen stainless steel, the “Capitelles des Mourgues” has been fermented and then aged a few months in large oak barrels. In this wine, the leading role is played by Mourvèdre with Syrah and Grenache as important supporting actors. I conclude with a contender from the New World. Morgenster in Stellenbosch makes a superb rosé from an unusual guest in the South African vineyards. This rosé is namely made of 100% Sangiovese and has a name which alludes to its Italian roots; Caruso.